Not Like the Picture has moved to Wordpress. Please drop by and visit! Today I started to think about how many creative sellers there are in and around Manchester. This may be due in part to the levels of support that are given to artisans here (like at the Craft and Design Centre or through Artlink), and I'm sure it's also due to the size of the area. Whatever it is that draws creative people here, I wanted to showcase what I came across, so here for your visual enjoyment are three of the best! Liberty Freedom sells gorgeous garments that have been stylishly designed and meticulously made. I was lucky enough to try on one of the jackets last year and I'm saving up to buy one! The fabulous pink linings are a great touch. Green Eyed Monsters is run by Katherine, who sells beautiful hand-dyed yarn. I particularly adore the GEM Bifflesock, which is incredibly light and soft. 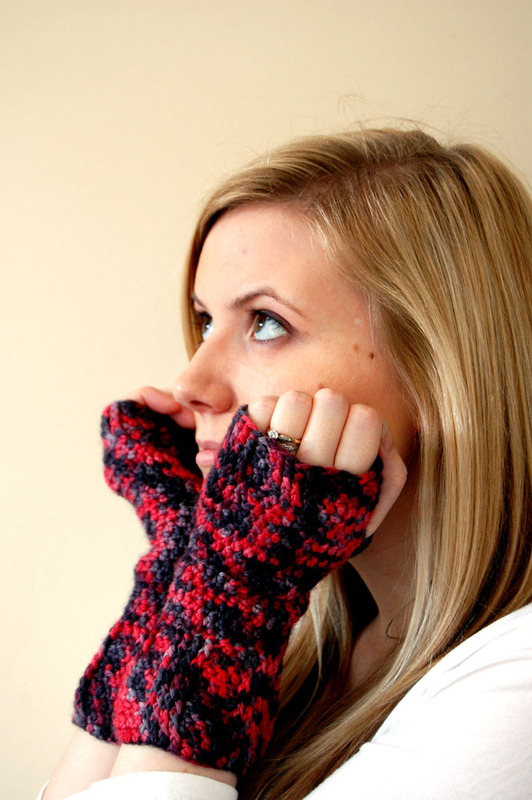 It's perfect for shawls, fingerless gloves and socks (of course). A Few Fine Things is located in the heart of the Northern Quarter, just around the corner from the Craft & Design Centre. 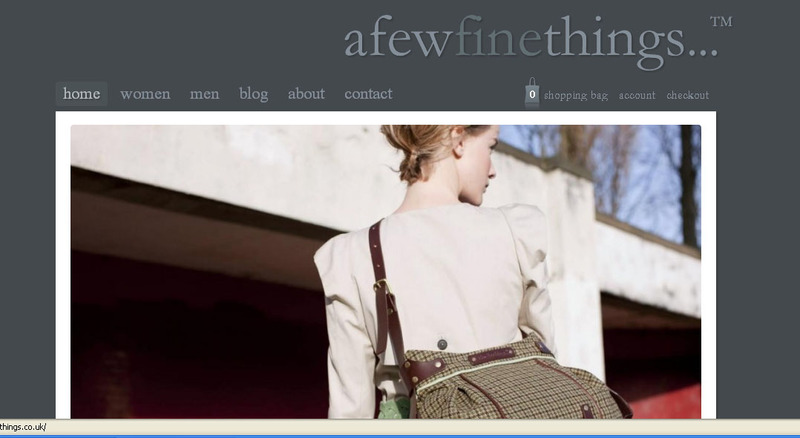 Their handbags and pouches are exquisite and extremely well-made. Perfect for a gift, the prices won't break the bank either. Who are your favourite local creative sellers? After lazing around drinking iced tea in the morning, we spent a lovely afternoon having a picnic in the park.We got a picnic set about 2 years ago and this was its first outing, which was very exciting! We went to Quarrybank Mill, which has a gorgeous meadow with huge trees for shade. I lay in the grass, drawing and reading all afternoon - it was heavenly and made me wish I could do it everyday. When we got restless we wandered around the old mill which has some great exhibits, including a demonstration of a spinning wheel. While we were strolling I saw this tree with beautiful blossoms. I adore the colours and wish I could replicate this in one of my accessory designs! Here's a little cowl I whipped up this week for my stepmum. She saw the yarn at my house and asked me to make her something, so I used my limited knitting skills to put this cowl together! 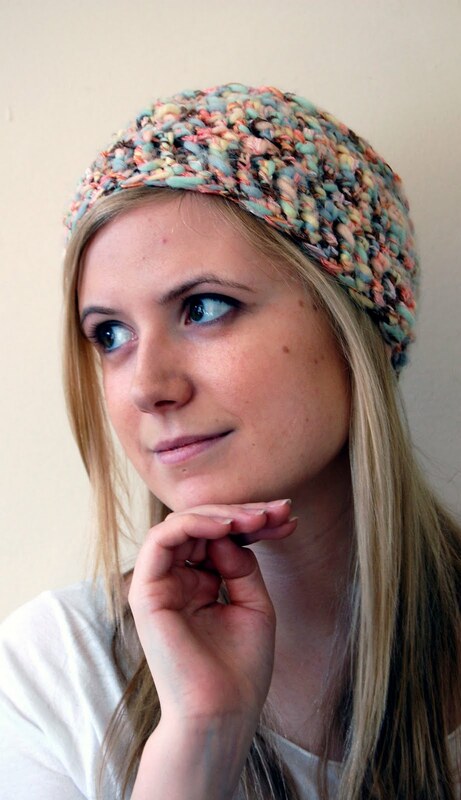 This pattern uses a simple basketweave pattern, surrounded by a garter stitch border. 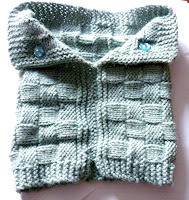 The cowl is knit flat and sewed up after blocking. CO 50 sts using long-tail cast on. Rep these 12 rows 7 times. BO and weave in ends, steam block flat. 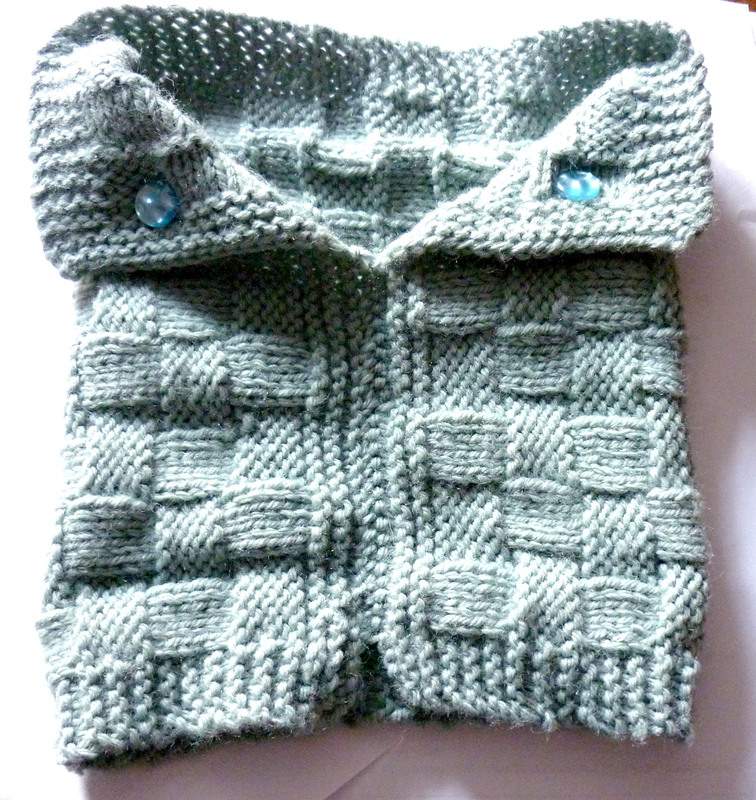 Sew on buttons, then sew cowl ends together from top of bottom garter stitch border to where corners begin to fold. Thanks to Knitting on the Net for the easy-to-understand description of the basketweave stitch pattern. 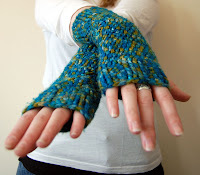 I spend much of my time perusing crafty blogs on the Internet (or "researching for my Etsy shop" as I like to call it). There are so many fantastic sites out there, both for showcasing handmade items and for advice on turning your crafty talents into a viable business. The visuals on Amy's blog are amazing! I don't know how she manages to take such consistently great photos but it's certainly impressive. I also love reading the insights into stylish homes, what an inspiration! This blog is written by Mena, who has decided to sew an outfit a week - completely from scratch! The photos and stories behind the outfits are so interesting. Sew Weekly has inspired me to start polishing my sewing skills - watch this space! A great mix of tutorials and advice, WTC has a fab, colourful design and interesting content. If you're suffering from an inspirational dead-end, it's the place to visit! Nina's adventures are so great to read. Her sewing projects are amazing and cool, and her children are adorable! Her posts always cheer me up. The following sites provide invaluable advice on how to conquer the world with your craft. There are practical tips, colourful photos and reeeeally nice people running the show - what more could you want? Please feel free to post your favourite craft blogs! Having been in Paris for the week, I came back with lots of beautiful yarn and was very happy to find my recently-ordered yarn swift and ball winder just waiting for me to make some yummy yarn cakes today! I absolutely love this colour, which is called 'Courage'. I adore this colourway, 'River'. These two yarns were purchased from L'OisiveThe, a fantastic cafe and yarn store in the Butte aux Cailles area of Paris. I went to the Wednesday evening knitting circle, TricotThe, which was wonderful! 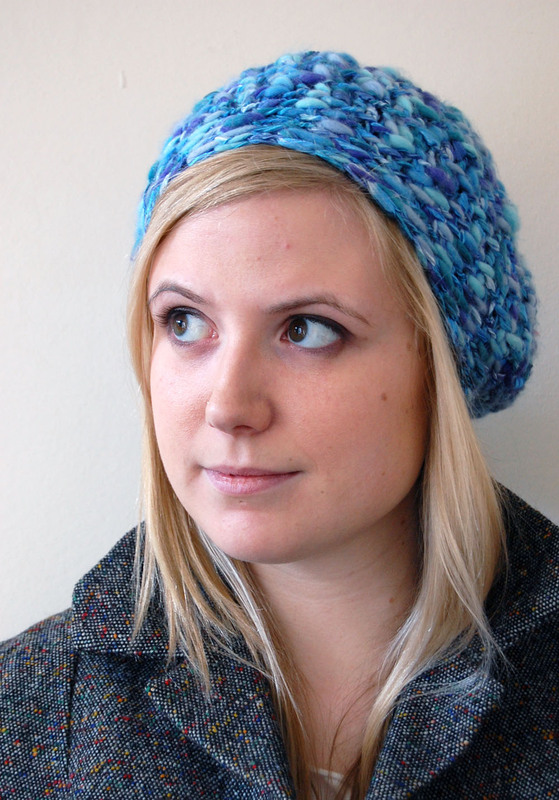 This was purchased from La Droguerie, a great Parisian yarn and notions store. They have gorgeous fabric, ribbons and buttons too! I can't wait to make more yarn cakes! 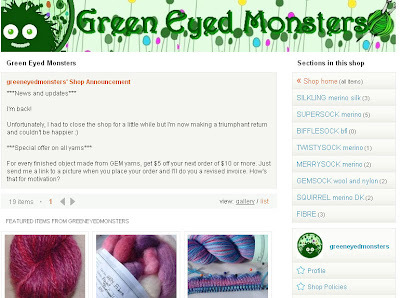 I've been Etsyfied! I had my first sale last week through my Etsy shop, Ellie Thouret Designs and I've been very excited about it. It's even kicked me into gear to take some decent photos of my designs to upload. Here's a selection, let me know what you think! I am a really big fan of websites like Etsy that encourage independent designers to share their work. I have a raft of designs to make up in the next few weeks and I hope I'll be blogging about more sales in future!